the Commissioners Court meeting later that morning. This follows a Leaders Assembly held on Sunday afternoon, November 16, at Sacred Heart Catholic Church Civic Center, where approximately 350 community leaders gathered in support of the plan to raise wages. Bexar County Commissioners Paul Elizondo and Tommy Adkisson, State Representative—and mayoral candidate—Mike Villarreal, and State Senator Leticia van de Putte supported the strategy. They committed to work with COPS/Metro leaders in raising wages for the lowest paid public sector workers, establish living wages for outsourced & subcontract jobs, and close the loopholes that allow some companies to apply for tax incentives without paying living wages. 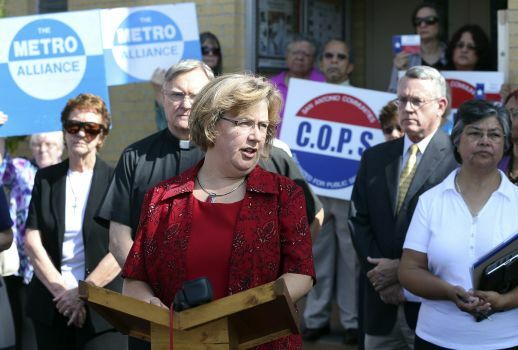 With one leader clearly gagged standing on the step of City Hall, COPS / Metro Alliance leaders denounced a new San Antonio city rule prohibiting non-profits from talking to City Councilmembers about the budget. Leaders pointed out that the new rule amounted to a gag order, even for nonprofits not requesting City funds for themselves. “Don’t send them back as if they were animals,” argued Fr. Walter D’Heedene of Sacred Heart Catholic Church. Speakers underscored that each child should have an attorney, get thorough processing (accorded in the 2008 Wilberforce Act) and have more exposure to vetted religious and social service organizations so that they do not become isolated. COPS / Metro Alliance is one of five Texas IAF organizations calling on Congress to preserve the protections that currently exist for Central American children.